The spring cleaning bug has bitten me. Hard. Which is right on schedule for this time of year. After winter has long lost its charm, that's when I usually start itching to "switch things up" in my house. This usually includes throwing away or thinning out a good number of my material possessions. When it's so muddy and dark outdoors, feels like a fresh breath indoors, ya know? Rather than get overwhelmed at the notion of downsizing your entire house, I find it's nicer to stick to a list. This list! If you're looking to unload, here's what to throw away or downsize, room by room. 2. Excessive knick knacks | I'm all about accessories, but more stuff = more to dust. Thin out the herd. 3. Books you'll never read again | Take an honest look at your bookshelf and donate the ones you're unlikely to crack open again. 5. Newspapers | News expires fast. Recycle those old papers! 7. Used up candles | Even if you love the scent or the jar is pretty, it's not useful if you can't light it anymore. 10. Games you don't play | Maybe you loved playing Clue as a a kid, but you don't now. Donate the games with all their pieces, and recycle what you can from incomplete puzzles and board games. 11. Ugly wall art | If you hate it, why is it on your wall in the first place? Make room for something you love. 12. Toys your pets don't like | Fido knows best. No one else in your house is going to play that squeaker toy. 13. Overzealous collections | No need to toss whole collections of things that bring you joy, but maybe try thinning them out. 14. One-use kitchen gadgets | Unless it's your coffee grinder, good kitchen tools should have multiple purposes. 18. Extra cups | Why do mugs seem to multiply behind cupboard doors? Thin out your collection by donating or recycling mismatched, chipped, or ugly cups. 19. Extra hand towels | I firmly believe tea towels are the new mug when it comes to gift-giving, and chances are you can downsize the buildup. 20. Specialty dishes you don't use | You don't reall need both hi-ball and low-ball glasses. 23. Plastic shopping bags | Yes you use them to line your tiny trash cans, but I'll bet you have way more than you'll ever use! 24. Old spices | Old spices lose their favor. Do your tastebuds a favor and purge to make room for fresher herbs. 25. Expired anything | Dig into the depths of your cupboards, pantry, and refrigerator and toss everything that's too old to eat. 26. Food you won't eat | On that note, toss/donate foods you know you don't like but somehow ended up with. 29. Takeout menus | All that info? It's available on the internet. 30. Unused cookbooks | Again, the internet. 31. Duplicates of tools | You're literally never going to use two can openers at the same time. 34. Orphaned socks | Or socks with holes in them. 35. Ill-fitting clothing | Stop subjecting yourself to feeling uncomfortable in your clothing. If it doesn't fit right, get it out of here! 36. Uncomfortable bras | Same. You should feel happy in your clothes. 37. Your least favorite pair of shoes | Unless they're necessary to your job or everyday life, you can afford to let them go. 39. Clothing you haven't mended yet | Either mend it or toss it. 41. Clothing with unintended holes in them | Not ripped jeans, but those leggings with a tiny hole in the backside. 42. Promotional t-shirts, hats, sunglasses, etc. 46. Yellowed t-shirts | You know what I'm talking about - those undershirts that have deodorant stains that are never coming out. 47. Excessive accessories | Thin out your collection of jewelry, scarves, and hats. Get rid of anything that you don't love. 52. Projects you know you're not going to complete | It's time to face the music, folks. 55. Extra bubble wrap | Save a little in case you need to ship something, but don't save too much. 56. Used tissue paper | Recycle the whole stash! 57. Dried up pens | Go through your desk and test all your pens. Toss the ones that don't work, or don't work well enough that you'd use them. 59. Cords that you don't use | You can't figure out what it goes to now, you're not going to be able to figure it out later. 61. Greeting cards you've been given | If it's too hard to let go of something this sentimental, you could scan them into your computer first before letting them go. 62. Business cards | Log the info into your phone, then it's into the recycling bin. 64. Rubber bands | Rubber loses its elasticity over time, so there's no reason to hold onto a huge stash of them. 66. Paper weights | Is it breezy in your office? Probably not. 67. Extra headphones | You really only need one or two pairs. 68. Bookmarks | Keep one or two, toss the rest. 69. Calculators | Unless you're doing math in your office on the daily, just use your phone! 72. Testers and samples | If you feel wasteful tossing testers, try this: Put them in a bowl, put the bowl within daily eyesight, and use one every day until they're all gone. 75. Old towels | Sometimes you can donate old bedding and towels to your local animal shelter, which is a much better place for that frayed towel you never use. 77. Perfume you hate the smell of | Even if it was a gift. 81. Old product boxes | Why do we feel the need to hold onto these? Can you really image a scenario where a manufacturer would void a warranty because you threw the product's box away? Yeah, me neither. Junk 'em! 82. Broken storage tubs | If an item can't perform its only job, it's gotta go. 83. Product manuals | Almost every manual is available on the internet! 84. Bolts or screws that you're holding onto "just in case"
87. Overly-specific seasonal decor | If you can only use it one day out of the year, it's just not worth it taking up space the other 364 days. 90. Textbooks | I know - they cost a fortune when you bought them. But when was the last time you actually opened one? 94. Gag gifts | They were "ha ha" in the moment, but what's not funny is how much dust they're collecting now! 95. Broken power tools | If you were going to repair them, you would've done so by now, right? 97. Duplicate tools | Some duplicates are okay, but you certainly don't need more than one of a lot of tools. Keep the best, donate the rest. 100. Old or unused chemicals | You've been procrastinating trying to figure out how to dispose of them safely - now is the time. 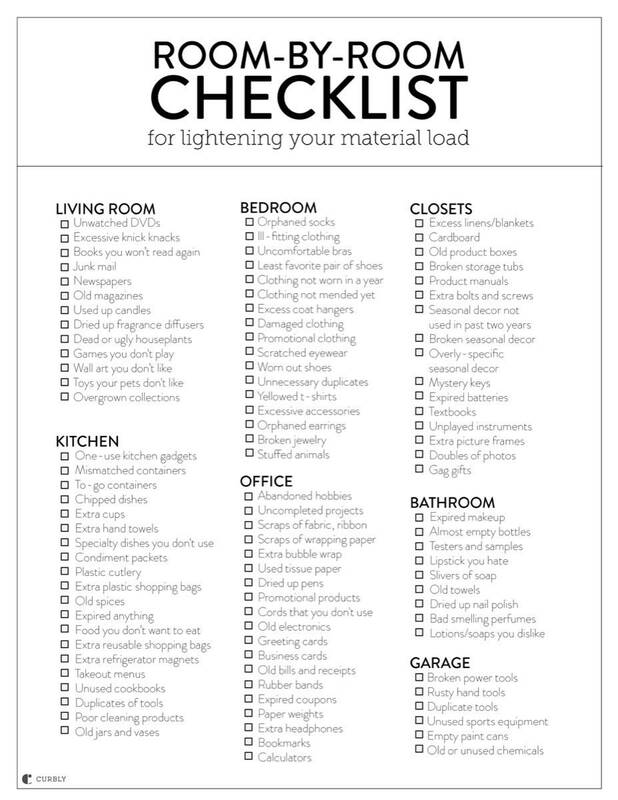 Click here to download this list as a printable checklist! Share this list on Pinterest! You won't be able to tackle your whole house in one day, so plan it out. Pick one room per day (or two) to work on, and before you know it, your home and your life will be feeling lighter. Now that you've purged your life, check out these organization tips for every room in your home.